Administrator Christian Seeley thinks the 2010 is the greatest Pichon Longueville Baron he has ever made, equaling some of the estate's colossal wines from vintages such as 1989 and 1990. It was certainly showing well when I stopped by the chateau in January. Opaque purple, with loads of charcoal, licorice, incense and some exotic Asian spices along with abundant cassis liqueur, blackberry and hints of roasted coffee and spring flowers, it is full-bodied and opulent, with relatively high tannins, but they have sweetened up considerably and seem less aggressive than they did from barrel. The oak is clearly pushed to the background by the wine's wealth of fruit, glycerin and full-bodied texture. This sensational Pichon Longueville Baron needs 5-6 years of cellaring, and should keep 30+ years. 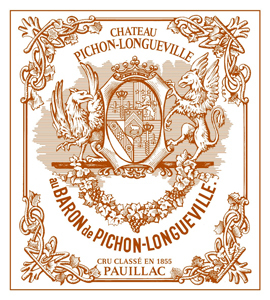 2010: A prodigious, blockbuster effort from Pichon Longueville Baron, the 2010 is reminiscent of this estate's titanic offerings in 1989 and 1990, but may be even greater with 30 years of longevity. Kudos to proprietor AXA and general director Christian Seeley. It was absolutely compelling on each of the three times I tasted it. Black/purple-colored with super concentration and richness as well as full body, it offers an awesome display of creme de cassis, blackberry liqueur, licorice, camphor and spring flowers. Stunningly pure and unctuously textured with high but sweet, well-integrated tannins, this superstar of the vintage is definitely a wine to purchase as a future. Anticipated maturity: 2015-2040. Tasted blind at the Southwold Bordeaux 2010 tasting. The Pichon Barton 2010 has a very linear, very focused bouquet with blackberry, cedar and mineral notes, not as intense as other wines but showing great clarity. The palate is medium-bodied with succulent ripe tannins, very fine acidity, a gentle grip with very composed, lightly spiced finish. This is a relatively understated wine within its group, sophisticated and classy. It has closed down a little since I last tasted it, hence the slightly lower score, but expect that to rise in the future. Tasted January 2014. Tasted at the Union de Grand Cru in London and later at the chateau. A blend of 79% Cabernet Sauvignon and 21% Merlot representing 50% of the total production, matured in 80% new oak for 18 months, the Pichon Baron has a glorious bouquet with blackberry, briary and wild hedgerow. The aromatics are bestowed ethereal purity and elegance. The palate is medium-bodied with abundant, mineral-laden black fruit tinged with espresso. This is very harmonious, a mouth-filling bravura of a Pauillac (perhaps the equivalent of Cos d'Estournel?) There is a pleasing sense of linearity and austerity on the graphite-tinged finish, plus enormous length that will leave you convinced that this is a benchmark Pichon Baron that sits comfortably alongside the 2009. Comparing them both side by side, I would put them on equal par although instinct tells me to bet on '10 over the long-term. Tasted November 2012. A blend of 79% Cabernet Sauvignon and 21% Merlot, 13.7% alcohol with a pH of 3.7 and total acidity of 3.3gms/L that will be raised in 80% new oak (the remainder one year old). This has a refined, much more understated nose than the 2009 that grabbed you by the lapels. It opens beautifully with aeration, blackberry, a touch of cassis, cedar and graphite, but a little gentler than other Pauillac 2010s at this early juncture. The palate is full-bodied with very fine tannins, good acidity, like the 2009, a Pauillac imbued with great symmetry and focus, very elegant and refined towards the finish that for once reminds me of the Pichon over the road. Very persistent and very "classic" towards the finish. Excellent. Drink 2015-2040+ Tasted March 2011. A dense and layered wine with lots of ripe and sweet fruit. Loads of currants, plums and tar. This is concentrated and almost jammy with velvety tannins. Powerful. Chewy. Try in 2020. This great vineyard has been producing classic Pauillac since the late 1980's when Jean-Michel Cazes of Lynch Bages took control. For the last ten years Englishman Christian Seely has been in charge and quality continues to rise. Latour-like in style, Pichon Baron has been a star performer in all our recent blind vintage tastings. This is 79% Cabernet Sauvignon, 21% Merlot and aged in 80% new oak. The Grand Vin has, since 2001, been produced only from the vineyards near Latour with those that used to go into the blend now making the second wine - Les Tourelles de Longueville. The breakdown is 45% grand vin, 50% Tourelles and 5% generic. This is so much bigger and more powerful than Pichon Lalande, a rival to Lascases this year. Dark purple, super-ripe Cabernet fruit on the nose with hints of prunes, black olives and cherries. On the palate this is a monster with fabulous intensity of classic cassis which is matched by strong but velvety tannins and notes of tar and cigar smoke. This is quintessential Pauillac and one of the top super-second performances in 2010. If you can't afford First Growths any more this is the wine to buy. I asked Christian Seely if this is going to be as good as the 1990 (one of my all time favourite clarets) and he replied that no, this will be much better as it is made from half the yield and only the best half of the vineyard. The richness of the black fruited mix gives real depth on the nose and flesh on the palate. Blackcurrant is underpinned by damson and firmed up by sloe. Powerful flavours pack out mid and back palate and although the tannins are firm they feel ripe. Wonderfully smoky fruit, quite compacted still with great natural depth of Cabernet Sauvignon and a great future. Drink 2022-45.